Hops are cultivated flowers used as a preservative, and flavoring in beer. The bitterness of a hop is used to balance the sweetness of the malt. The hop’s essential oils add a unique flavor and aroma to the beer that cannot be achieved by using any other plant in the world. The hop plant is a spiraling perennial vine that grows in regions with slightly acidic soil, ample water and a lot of sunlight. Hops can climb strings, or poles and reach heights of 40 feet. A hop’s flowers are called a Cone, and most commonly dried before use, but can also be used “wet,” right off the vine (or “bine”, since this the technical term used for plants that climb). What is Hopsteiner’s hours of operation? 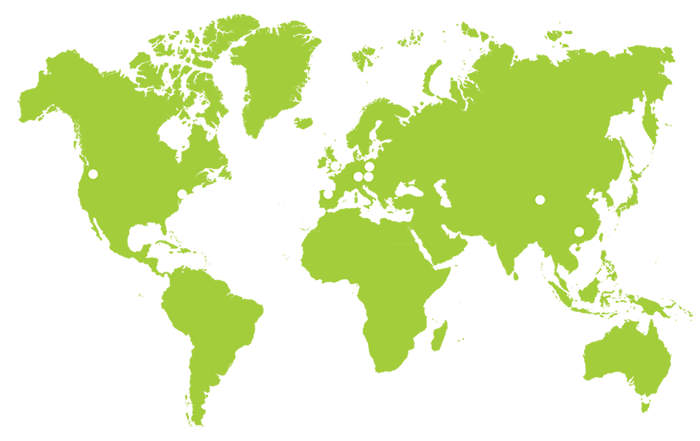 Hopsteiner offices are located across the globe in different time zones. We are available Monday – Friday from 9am to 5:30pm EST. You can call our toll-free hotline: 01992 572331 or email: enquiries@hopsteiner.co.uk or visit our CONTACT page to find your local Hopsteiner Account Manager. Yes, Hopsteiner is one of the largest international hop growing, trading and processing firms in the world, producing top quality hops and hop products. Hopsteiner will continue “to grow” because we’re here for the long haul. What is Hopsteiner doing to keep up with the demand for hops? For the past six generations, Hopsteiner has been continuously evolving and developing the science and technology for growing, processing and distributing hops through constant research and development. Hopsteiner’s 170 years of experience and tradition is heading into the future, in the pursuit of growing even more hops. Hops that are stronger, healthier and more sustainable. Hopsteiner is researching and analyzing new possibilities for everyone. What makes Hopsteiner so different than other hop providers? Hopsteiner is part of both the farming and brewing industries. We stay close to industry shifts and what’s trending to help us accommodate the specific-type of hops brewers are looking for. Hopsteiner is planting more acreage to meet the sheer volume of hops needed. Hopsteiner makes investments to stay at the forefront of quality hop growing, efficiency, technology, infrastructure and SUSTAINABILITY. Does Hopsteiner offer hop samples to homebrewers? We encourage homebrewers to contact their local homebrew supply shop to find Hopsteiner hops. Does Hopsteiner sell directly to homebrewers? We do not sell directly to the public. We rely on homebrewing supply shops across the globe to sell our Hopsteiner hops to their customers, who become our brand ambassadors, and a conduit to the homebrew community. Do you have a price and availability list? Yes, you can always find our SPOT HOP AVAILABILITY LIST located on our website. As prices fluctuate we ask that you contact your Hopsteiner Account Manager for the latest hop pricing. Can I buy CO2 Hop Extract directly from Hopsteiner? Yes, we sell CO2 Hop Extracts through spot sales and for larger quantities, through contract sales. Contact your Hopsteiner Account Manager for more information. How do I get new and experimental hop varieties? Ask your Hopsteiner Account Manager about availability, VARIETAL DATA, and samples of our innovative, new experimental hop varieties. Does Hopsteiner offer downstream products? Where can I get assistance on calculation rates for my brewing? Brewing Assistant Calculators can be found under TOOLS on our website. Our seasoned staff can provide a wide range of services including on-site support at your brewery. Does Hopsteiner offer organic hops? Yes, Hopsteiner does offer both leaf and pelletized Certified Organic Hops. Where can I find statistics and industry reports on hops? Up-to-date statistical reports and market data can be found at NEWS/EVENTS on our website. How long has Hopsteiner been in the hop industry? S.S. Steiner was FOUNDED IN 1845 as a small hops dealership in Laupheim, Germany. Today, Hopsteiner is one of the largest international hop growing, trading, breeding, and processing firms in the world. How are new hop varieties developed? Are they GMO? Hopsteiner’s pioneering spirit and passion has resulted in producing unique and innovative new hop varieties that defy comparison. We use traditional methods to cross selected parents whose offspring become new hop varieties. Absolutely no GMO practices are used. Who is my account representative at Hopsteiner? Find out by calling our toll-free hotline: 01992 572331 or email: enquiries@hopsteiner.co.uk or visit our CONTACT page to find your local Hopsteiner Account Manager. What Hopsteiner packaging sizes are available? Pellets are available in 4 x 5kg foils in 20kg carton net weight pouches. Vacupack Leaf hops are available in 4 x 5kg foils in 20kg carton net weight pouches. What type of package do your hops ship in to protect their freshness? Pellets and whole leaf hops are packaged using Hopsteiner’s proprietary Mylar pouches with air displaced by inert gas to protect your hops from oxygen and light. Pouches are packed in sturdy, reinforced shipping cartons to further assure our products arrive to you in excellent condition. Each carton is affixed with a Hopsteiner QR code containing all of your product’s lifecycle data. What information is contained in Hopsteiner’s packaging QR code? Alpha and Beta Acids, Pellet Moisture Content, as well as other important Hop Analysis and Data that can be accessed with a scan of the Hopsteiner QR Code affixed to each carton of hop products. When are hops harvested and how soon can I expect my hop pellets? The harvest window for U.S. Northern Hemisphere hops is generally mid-August till the end of September. Most of the varieties are pelletized within the first 4 months following HARVEST SEASON. Product generally becomes available for shipment in November each year. How long will my hops stay fresh? Properly packaged hop pellets in a sealed pouch stay fresh for three years if kept refrigerated. Our PRODUCT SPECIFICATIONS (PDF) contain detailed recommended shelf-life information for our full range of products. Are any hop varieties exclusive to Hopsteiner? Yes, we have developed Apollo™, Calypso™, Delta™, Eureka!™, Lemondrop™ and Super Galena™ hop varieties. Why are some Hopsteiner hop varieties always sold out? As you can imagine, our new experimental and proprietary HOP VARIETIES are some of the hottest hops on the market. Many go quickly on the spot market. We suggest contracting as a means to guarantee availability. Where does Hopsteiner purchase hops? We are a GLOBAL PURCHASER OF HOPS, purchasing from independent family-owned farms throughout the world. Hopsteiner’s stringent quality control system and relentless monitoring of every lot of hops received has built our reputation synonymous with top quality hops. What is the purpose of a Hopsteiner hop contract? By contracting all, or part, of your hop needs, you can assure yourself of availability and set pricing. It also allows hop growers to plan for future acreage and ensure that the hop supply matches the demand, which is good for everyone. How do I establish a Hopsteiner hop contract? Contact your Hopsteiner Account Manager to learn more about hop contracts and how they can work for you. Is there a minimum order quantity for hop contacts? Contracts are written for a minimum of 220 lbs. of pellets, or 200 lbs. of leaf hop. What is the difference between contract year and brewing year? Contract Year, is the year in which the hops are grown and harvested. The Brewing Year varies by customer, but typically is the calendar year. As an example, you may have a 2015 Crop (Contract) Year to meet your needs for brewing during the 2016 Brewing (Calendar) Year. How far in advance can I contract hops? Hop contracts can be written for, as little as one year in advance, or up to five years in advance, depending on the customer’s needs. Can hops be dangerous for a pet, or animal if ingested? Poisoning called MALIGNANT HYPERTHERMIA has been seen in cats and dogs that have accidentally ingested spent hops with symptoms that include increased breathing, anxiety, vomiting and can often result in death. Contact a Vet or a Poison Control Center immediately. How do I schedule a brewery visit with my local Hopsteiner Account Manager? Schedule a visit by calling our toll-free hotline: 01992 572331 or email: enquiries@hopsteiner.co.uk or visit our CONTACT page to find your local Hopsteiner Account Manager’s contact info. We look forward to visiting you. How do I arrange visiting for Hop Selection, or Hop Harvest? Contact your Hopsteiner Account Manager to schedule a visit to Yakima during HOP HARVEST to see first-hand who we are, and what we do. Hopsteiner Quality….The Proof Is In The Pour!